In the martial arts today there is so much diversity that students rarely get a chance to peer past the veil of an art to really understand how it is composed. Instead, preconceived notions, suppositions or movies fill in the gaps to create something else. I would like to give everyone a glimpse into a traditional Northern Chinese system of study, that of Fann Tzi Ying Jow Pai -- Northern Eagle Claw. If you have ever felt the grasp of an Eagle Claw master, the pain is intense. No ordinary grip, the fingers close like white hot talons of steel piercing into you. It can be agonizing. Eagle Claw's roots stretch back over 850 years to the legendary Shaolin Monastery nestled in mountains of Northern China. And like many other systems, it too was inspired by the fighting movements of animals (White Crane, Tiger,Snake, etc.). Eagle Claw's specialty is developing the hand grip and finger pressure to grasp, trap, seize and manipulate opponents' limbs, joints, pressure points, veins and other targets. In this way it resembles Japanese jujutsu with its joint locks and fast take downs. Testimony to its effectiveness is also seen in the fact that many other Chinese arts have adopted Eagle Claw techniques. Historically Eagle Claw was the result of China's Oldest Chin-Na tradition (the art of seizing, locking, breaking and pressure points) being mixed with Northern Shaolin Arts. Created during the Sung Dynasty by General Yui Feh (Ngok Fei in Cantonese, also credited with creating Xing-i), he is said to have formed the art after seeing how an Eagle effectively used its claws against its enemies. The art was then taught by the general to his soldiers. Today the art represents a vast cultural heritage and repertoire of martial arts techniques and methods. Included is a progressive mix of striking and kicking, grabs, locks, throws, and counters to the grabs, locks and throws, and the open use of pressure points for all of the above. Lightening fast circular movements are used rather than the direct totally committed punches of karate. It also employs subtle deflections and body moves to attack and avoid strikes. The system itself consists of acrobatics, the 10 beginning sets used by the Ching Mo Association, in excess of 50 eagle claw empty hand sets, a very large number of weapons sets, two person empty hand and weapons sets, climaxing with the 108 locking form with over 860 individual movements to be remembered. Then there are the Eagle Claw sparring practices, using only techniques from the Eagle Claw system and requiring all fights to go to a completed lock. The forms are lengthy in the Northern Shaolin tradition. The complete Eagle Claw curriculum is comprised of more than 75 sets. The beginning sets used by the Ching Mo Association are not simple. They are complex systems of study. One of the most basic sets, Tam Tui, can be a complete system of kung fu in its own right. This makes even the beginning training in Ying Jow Pai quite challenging. The study of those Eagle Claw sets builds on the strikes, kicks and eagle claw grabbing techniques. Decades of work on those claws are one of the major tools to develop the hand's ability to grasp specific pressure points. This is supplemented with additional hand and finger strength drills as well as hands on practice. 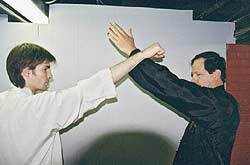 The empty hand forms build in complexity until such sets as Hon Kuen (Walking Form) which incorporates all of the Eagle claw hand and foot techniques, Lin Kuen (the 50 rows) which contains every variation of eagle claw locks and may well be more complex than the entire body of Okinawan Karate itself, and the form Eagle Tames Tiger. Accompanying these forms are the Eagle Claw formal 2 person practices. They begin with The Eagle Claw Principles designed to teach the underlying principle of Eagle Claw technique. They also teach students how to fit or use their techniques against various attackers and attacks. Students study many two person sets in order to develop more skill applying Eagle Claw's locks as well as to learn the counters to those locks. Here is where the use of acrobatics enters. Acrobatic skills are used to gain freedom from some of the locks, and well as to retain the lock on the adversary. Complement this with a very wide range of traditional Chinese weapons sets and two person forms and one sees how the skill and strength of the Jing Jow Pai student continues to increase. This is a long road of study, with no shortcuts. Attempt to learn the forms solely from video tapes or books and you will not receive the fine detail the proper instructor can offer. There is a rather tactile way to understand whether instructors developed their clawing techniques properly. When they grab you, it feels like two needles are being pushed into your arm. Without the long specific training, the locks feel simply like grabs and are vastly less effective. 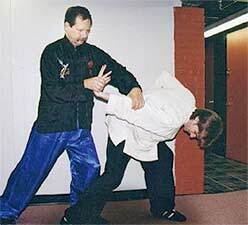 One Master Instructor is Ernest Rothrock, owner of Rothrock's Kung Fu & Tai Chi Studies in Pittsburgh, Pennsylvania. 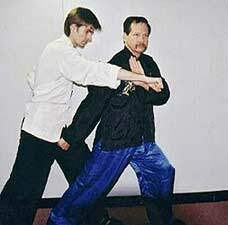 He has been training in Faan Tzi Ying Jow Pai and Wu Tai Chi Chaun with Master Sheum for almost 30 years. Many contemporary instructors in other martial arts are also exploring the utility of grappling and striking the opponent within their systems. 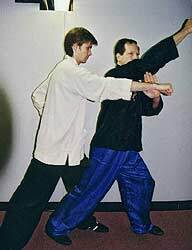 One of the strikes often taught in those studies can be found in the Faan Tzi Ying Jow Pai system. In the accompanying photos Mr. Rothrock demonstrates how this technique is performed in the Eagle Claw curriculum. The attacker grabbing the right wrist. The defender grabs the attacker's hand. the triceps tendon of the attacker. 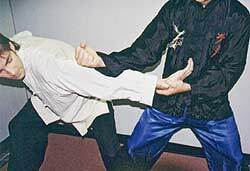 One of the fascinating parallels in martial arts development can be found where almost the entire 48 self-defense techniques described in the Okinawan Bubushi (a once secret text owned by many of Okinawa's early 20th century karate founders), reportedly from Crane Fist and Monk fist systems, are basic techniques within the Faan Tzi Ying Jow Pai system. While one would not surmise that Eagle Claw was a source for the training behind the system described in the Okinawan Bubushi, the parallels are uncanny. Such study offers a new way to understand the original Bubushi art. Here Mr. Rothrock demonstrates several of the Eagle Claw answers to those diagrams in the Bubishi. An attacker throws a right punch to Defender's face. The defender parries with left outer arm. The defender turns 180 degrees to the left and parries attacker's arm with left palm. The defender strikes down into the groin with the right arm. I hope this brief article provides the reader with a glimpse into a truly fascinating martial art, Faan Tzi Ying Jow Pai, Northern Eagle Claw. Readers who practice other Chinese kung fu systems might recognize some Chin Na (seizing and locking) components in their own art. For karate students the connections is more obscure. Eagle Claw probably did not directly influence the development of Okinawan Karate since it remained in Northern China up until the 1920's, well after Karate's development. But, Chinese kung fu systems did provide inspiration and influence upon the development of karate on Okinawa. Thus undoubtedly some grasping, seizing and joint manipulation knowledge bled over into early karate. Early 20th century Okinawan masters, such as Gichen Funakoshi, spoke of developing the hands and grip so as to be able to seize an opponent tightly. In his early works he also demonstrated joint locks and take downs. Others, such as Goju Ryu's founder Miyagi developed his hands to the point that he could rip off chunks of bark from trees or be used to penetrate soft areas of the body. 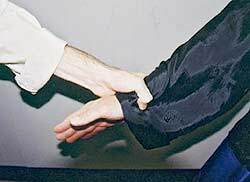 Within most karate systems today, however, this training is not longer emphasized. Only within older karate kata are the ancient skills of grasping and piercing techniques still retained. (1) Master Instructor isn't simply a title; in the case of Faan Tzi Ying Jow Pai, it represents a series of concrete acomplishments. It is awarded upon completion of a very grueling examination requiring extensive knowledge of a most complex system. Only a qualified instructor with decades of work on the system would be able to pass the complexity of this examination. The requirements for this examination are a complex story in their own right. There are two main Eagle Claw lineage's in the USA at this time. General Ngok Fei developed Ying Kuen (eagle fist or system) and in1920 Ching Mo Gymnasium invited Chan Tzi Ching to teach the system at their location. It was from here that the two lineages developed. Victor Smith is a respected teacher of Isshinryu karate (6th degree black belt) and tai chi chuan with over 26 years of training in Japanese, Korean and Chinese martial arts. His training also includes aikido, kobudo, tae kwon do, tang so do moo duk kwan, goju ryu, uechi ryu, sutrisno shotokan, tjimande, goshin jutsu, shorin ryu honda katsu, sil lum (northern Shaolin), tai tong long (northern mantis), pai lum (white dragon), and ying jow pai (eagle claw). Over the last few years he has begun writing on, researching and documenting his studies and experiences. He is the founder of the martial arts website FunkyDragon.com/bushi and is Associate Editor of FightingArts.com. Professionally he is a business analyst, but also enjoys writing ficton for the Destroyer Universe.